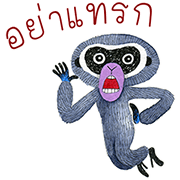 http://www.line-stickers.com/ – Shaneezaa Line Sticker | Shaneefer’s best friend Shaneezaa is such a gibbon. This little fella’s here to help you unleash your creativity with the hottest Thai expressions around! Next post Shokotan’s Talking Stickers!